So, I'll reverse the title at the top. Congratulations to the winners of the last contest. The Candy Cane Cupcake Killer will go to Susan B. from Seattle, WA. Murder on St. Nicholas Avenue will go to Mary H. from St. Louis, MO. Due to the holidays, that was the last giveaway until 2016. The next giveaway will start on Thursday, January 7. Yesterday, we talked about what we were reading. I admitted I was having a hard time getting into a book. I found one that works. 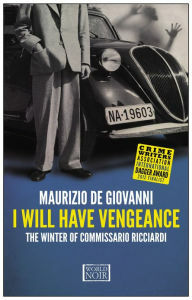 I'm reading Maurizio De Giovanni's I Will Have Vengeance: The Winter of Commissario Ricciardi. It's set in Italy in 1931, and it features Ricciardi, responsible for investigating crime during Mussolini's reign when Il Duce proclaimed there was no crime in Italy. I jsut started a book that was recommended (can't remember where I read about it) set in 1965 Hollywood, but it isn't what you'd expect: Adam Christopher's MADE TO KILL is about The World's Last Robot, supposedly a private eye but actually the world's best hitman. I just finished The Summer of Commissario Ricciardi. Virtually no action at all, but I got through it okay. I love that, Rosemary. I've learned a lot of what I know from mysteries and detective novels. I love her comment! Oh, that's an interesting premise, Jeff. Sounds like it might be good. Well, that doesn't bode well for other books in the series, Glen. Thanks for the update! I'm madly reading my way through a series of mysteries by Harry Bingham set in southern Wales. They are very good. Now I have to travel to Wales to check out the locations!